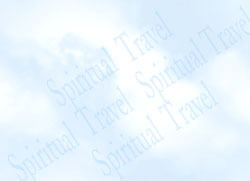 One of the fascinating elements of spiritual travel experience (out-of-body or lucid dream experience where there is a spiritual goal) is the material side of the psychic or non-physical worlds. While out of the body in non-physical environments, one experiment the spiritual traveler can perform is to closely examine the properties of the "matter" encountered. The surprising thing is that if the spiritual traveler in an out-of-body state or lucid dream environment examines and analyzes non-material objects closely, they have the same qualities as physical objects. If one looks at objects in an attempt to determine if one can tell the difference between an object in the inner world and a physical object, it seems impossible to tell the difference. I would pick up an object, examine it visually, tap it, feel its texture and weight, examine its hardness, or my reflection in it, all in great detail. If I was not intending to change the object in any way, it almost always appeared to be an everyday physical object. Recently, I examined the shoes I was wearing while in an out-of-body state in a dream environment. They were made of medium brown suede and try as I might, one could not find anything unusual about them. I felt the texture of the suede, and looked at the stitching and the way the piece that held the laces was attached to the body of the shoe. I used to work with leather and was surprised at the fineness of the "workmanship" on these nonmaterial shoes. In a similar situation, I examined my hands feeling the fingers and watching them move as I made fists and then opened my hands repeating the activity over and over again. My spiritual or dream body fingers, hands, arms, and wrists worked as expected with each movement creating the appropriate corresponding internal sensations. Some time ago, I was in a jungle environment, and the sharpness and clarity of the vegetation was equally apparent. I examined how the light reflected off and filtered through the leaves in this tropical dream environment. The richness, variety, and beauty of the plants was surprising to someone such as the author who had little botanical background and training. The inability to distinguish between material and nonmaterial objects also holds for individuals. At one point, I was conscious in a dream and met a small girl and looked into her eyes intently. She seemed, at least on the surface, to be a normal child that one would meet in the physical world. I was interested in seeing if I could sense a consciousness in this child. As I examined her closely, she seemed to be looking back at me just as if it were a normal interaction between two people on any street corner. The same is true for complex landscapes where nonmaterial woods, fields, mountains, and urban settings have the same level of detail that one would expect to find in the physical world. The traveler can determine through this kind of experimentation that there is no obvious way to distinguish physical objects and, to a lesser extent, individuals from nonphysical objects and individuals. The senses give the same impressions in spiritual travel or OBE environments as they do in the physical world, each sense (sight, sound, and touch) corroborating and confirming a consistent view of the object or person. Though the traveler knows with complete certainty that the dream object is not real in the conventional sense of being made of physical matter, it still appears real. The realization that inner environments can appear in every detail as real as physical environments is another important lesson that spiritual travel teaches. The implications of experimenting and learning such a lesson have a vast reach that affects philosophy and religion in countless ways. For instance, in the area of religion, this discovery has implications for those who wonder about life in heaven and hell, or any non-physical or spiritual environment. If the objects in the mind can appear completely real while also being non-physical, the notion of an afterlife where beings live in environments much like physical environments seems quite plausible. Individuals could exist in an afterlife interacting with familiar objects and normal environments without ever even considering them alien or peculiar. Another religious idea that can be explored in relation to lucid dreaming is the concept of creation with respect to the notion of design. There is a medieval argument for the existence of God that is best summed up by the following 19th century philosopher's statement: "If you find a watch on the road, there must be a watchmaker somewhere." Similarly if you find a complex universe, God must have designed it (this is Saint Thomas Aquinas' "argument from design"). But in a lucid dream, one can find enormous complexity and detail where objects and people are not designed. They just appear. Some might say they are designed by the unconscious mind but the concept of design seems to require a rather extreme form of attention to detail and considerable planning. The concept of design seems antithetical to both unconsciousness and the unconscious mind. Freud is vague about how the unconscious using repressions and hidden desires creates symbolic narratives to produce dream plays. He uses terms such as compression, conflation and omission and adds on a process of "secondary revision" that takes all these unconscious motivations with their distortions and assembles them into a coherent narrative structure. But the explanation of how the dreamer arrives in a three-dimensional environment to experience the dream play seems entirely absent from his theories. Freud's concept of the unconscious provides the motivation to produce the dream play and if we are generous perhaps even a story board which sequences the symbols and provides the backdrops. However there is no explanation as to how the unconscious contains the mechanisms that create a seamless blending of these static symbols into a dynamic dream play where the dreamer experiences three-dimensional actors complete with stage, lighting, script, and props. Such an incomplete and inadequate theory of the origin of dreams and dream environments unfortunately seems to the best available. The theory of how the unconscious mind is able to create dreams is wholly inadequate to explain lucid dream experience. Freud's explanations of the source of dream experience are so unconvincing that claiming that both dreams and lucid dreamscapes are created by the unconscious mind is not very different from saying that are created by magic. It seems that 200 years of psychological theory and experimentation has not helped psychologists explain how dreams work just like 400 years of research in physics has not helped physicists explain how gravity works. In the lucid dream as with the material world, we have objects with a complexity that far outstrips anyone's ability to create or design them, yet they appear anyway. There seems to be creation or design but without a designer. This puts the lucid dream reality in the same category as physical or objective reality where either God "designs" the dream environment, or its complexity spontaneously grows (or evolves) out of the cosmic material or spiritual soil like a plant. Whether the lucid dream is a product of material or spiritual reality, its complexity of design offers the same challenge as the physical world in terms of looking for a explanation of how this complexity arises. In philosophy, the father of modern philosophy in the West, Descartes, developed the foundation for our scientific world view by emphasizing rational analysis and pointing out that mathematics was the key element in understanding the material world. He did this by making a distinction between the mind and the body that continues to influence the way we see the world. This mind-body dualism is echoed in such oppositions as heaven/earth and spiritual/material. This fundamental dualism of Western philosophy is based on the following two elements. The first is the realm of the mind (which cannot be measured or has no size or extension) which is the realm of thought (and perhaps heaven). The second is the world of the body (or matter) which is the realm of things (which can be measured and are therefore the objects of scientific investigation). Based on our previous discussion, an argument can be made that there are indeed "things" in the realm of the mind and it is not just a place of pure thought. If this is true, the classical distinction no longer applies and much of the analytic reasoning that tried to understand the world in terms of this false distinction loses it power to persuade. The experience of lucid dreaming could have changed the course of Western philosophy by seeing the mind as not only the location of thoughts but also a place of "material" things that stimulate the inner senses and present a cohesive realm of being parallel to the physical world. The classical mind-body dualism where the thoughts of the mind stand in stark contrast to the measurable things of the physical world seems to blur and even dissolve. William James, the psychologist and philosopher of religion who wrote The Varieties of Religious Experience proposed extending the empiricism of his day (empiricism holds that the best way to understand the nature of reality is through the five senses) to embrace a wider arena of experience. He proposed a radical empiricism which extended empirical data beyond the physical or biological senses. He said that the study of religion and psychology should include sense data from the inner senses and the areas of dreams, visions, religious experience, and psychic phenomena. The author's approach to spiritual travel accepts this notion of "radical empiricism" and denies the typical empiricist's approach which excludes such data as illusory, too difficult to study, or not worthy of study. What is difficult to accept is that those doing brain research (psychologists and neuro-physiologists) could believe that the physical brain is so complex and sophisticated that it can create entire inner landscapes and interactive three-dimensional worlds involving all the senses all by itself. This seems more plausible when in a normal dream state where the process goes by as the dreamer sits passively like when watching a movie. In such a state, there is very little analytical skill and the powers of perception are dimmed. However when the full light of consciousness (lucid dreaming) is brought to the dream world, and the individual is able to closely observe and analyze the environment, the inner world looks less like an illusion of the brain, and more like a stand-alone world - a completely separate and parallel reality to the physical world.